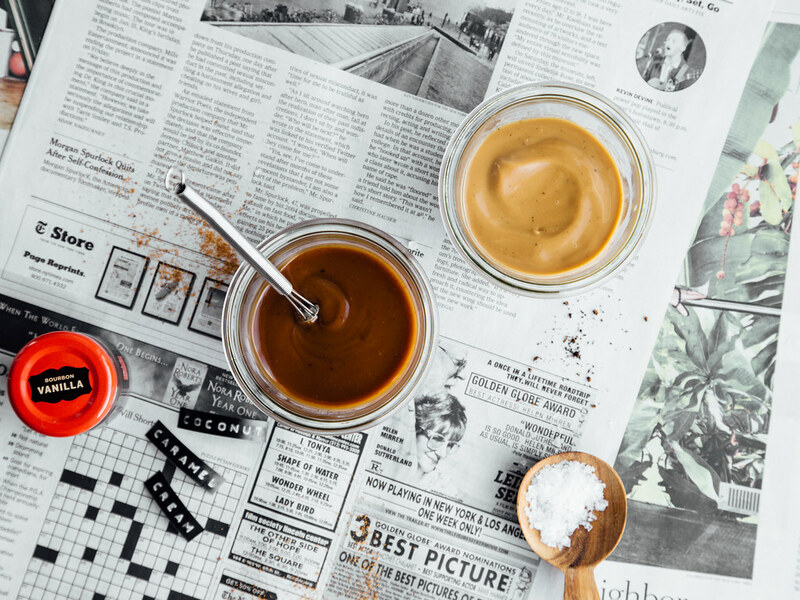 If you've been around these parts for the past half decade, you're probably well aware that this is the fourth caramel sauce recipe to appear on this site (previously: how to make caramel sauce, easy caramel sauce, and almondmilk caramel sauce). 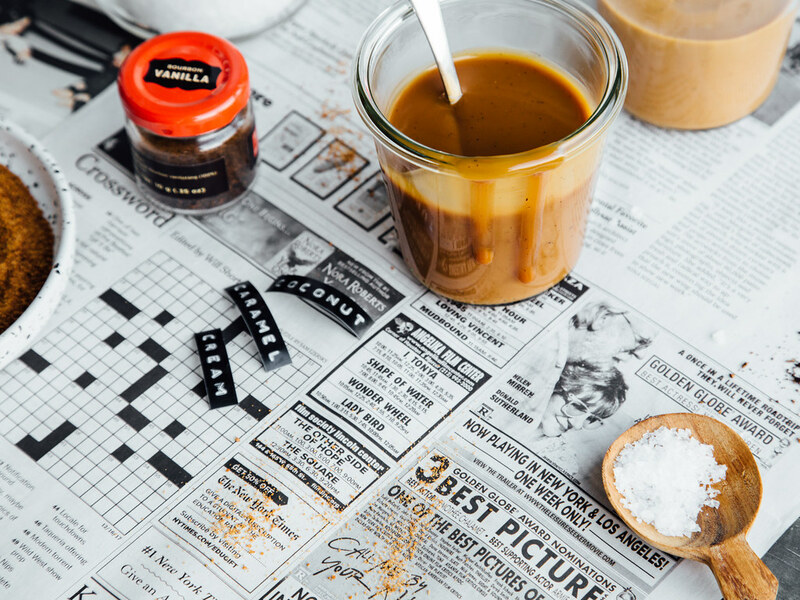 A part of me feels like I should be embarrassed about that because four caramel sauce recipes is borderline excessive but this new one.. this new one is a game changer. Partly because you can basically just set a timer and let it boil away (unattended) on the stovetop but mostly because it doesn't require the full fat coconut cream to be separated from the water (low maintenance coconut milk caramel sauce, FTW). The other thing I love about this recipe? The flavor. 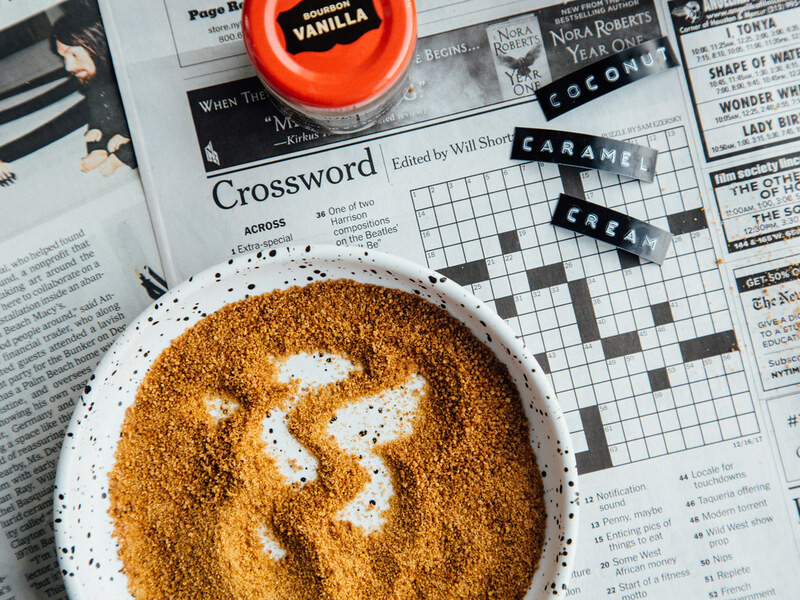 The flavor is BANGIN' and that's all thanks to a delectable granulated sweetener called coconut sugar. But considering I've been a little bit of a, uhh, coconut sugar scrooge, I suppose I've got some explaining to do. Here's the thing: I like coconut sugar. I like coconut sugar a lot. But it drives me wild that certain people/publications on the WWW act like it's a healthy alternative to cane sugar et al. Because it's not. Sure it retains some of the nutrients from the coconut palm tree but GUESS WHAT? it's still sugar, guys. I like and celebrate coconut sugar (in certain applications) (I'm a firm believer that dessert cookies made with cane sugar trump all) for no reason other than the fact that it tastes good. I couldn't care less that it contains nutrients that could be beneficial to my health because I eat a well-rounded diet and don't rely on sugar (or salt, either) to do anything other than make whatever I'm eating taste better than what it would without it. And this is where I reiterate that not everything we put into our bodies *needs* to be nutritious; it's ok to eat something solely because it tastes good. Also? 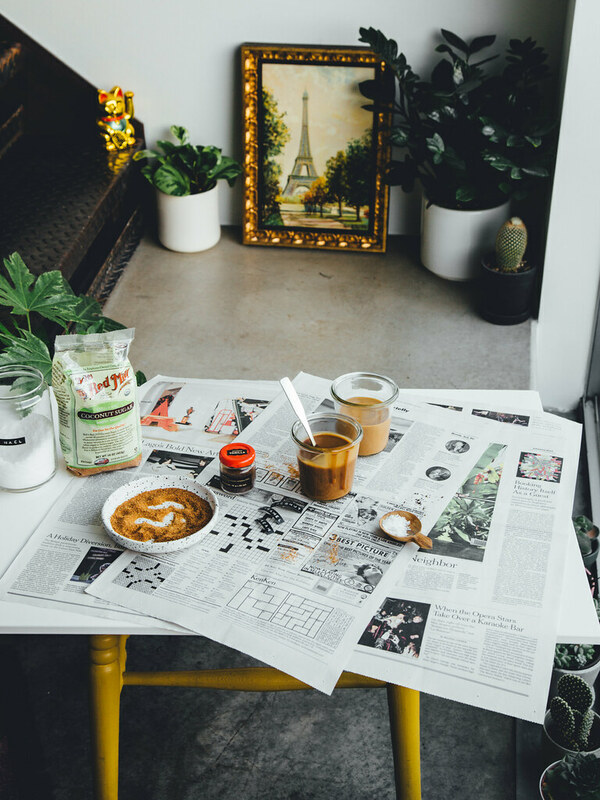 According to Dr. Andrew Weil, "there isn’t much difference between white table sugar and other natural sugars including coconut, honey, maple syrup (my personal favorite), molasses, and sorghum. To the body they are all sugar to be converted to glucose for metabolic fuel." So there you have it. Sugar is sugar is sugar. And that's actually not a completely terrible thing. 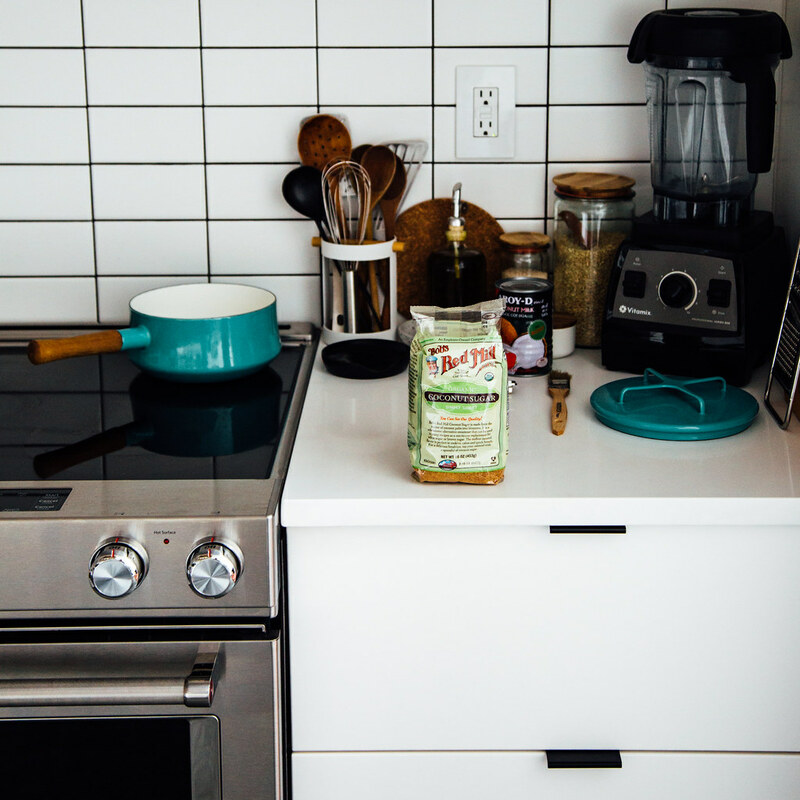 Notes: Refer to this post to see which canned coconut product is best for this application. Not all coconut milks/creams are created equal and if you don't use one of my recommended varieties, I can't guarantee your caramel will turn out the same. If you're using the salted coconut caramel cream sauce for dipping, drizzling, etc., use a can of coconut milk. 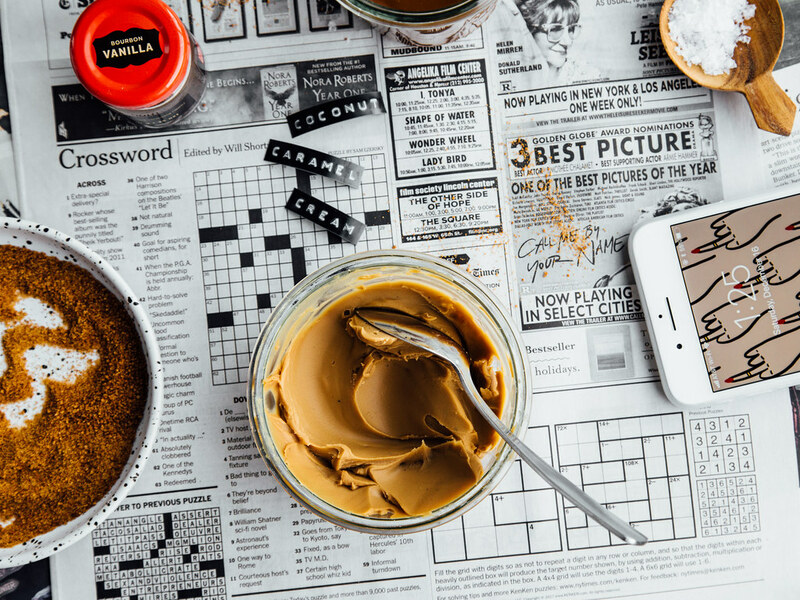 If you're using the coconut caramel cream to serve as a layer in a pie or tart (or something similar), use a can of coconut cream (the end result is pictured in the second-to-last photo). 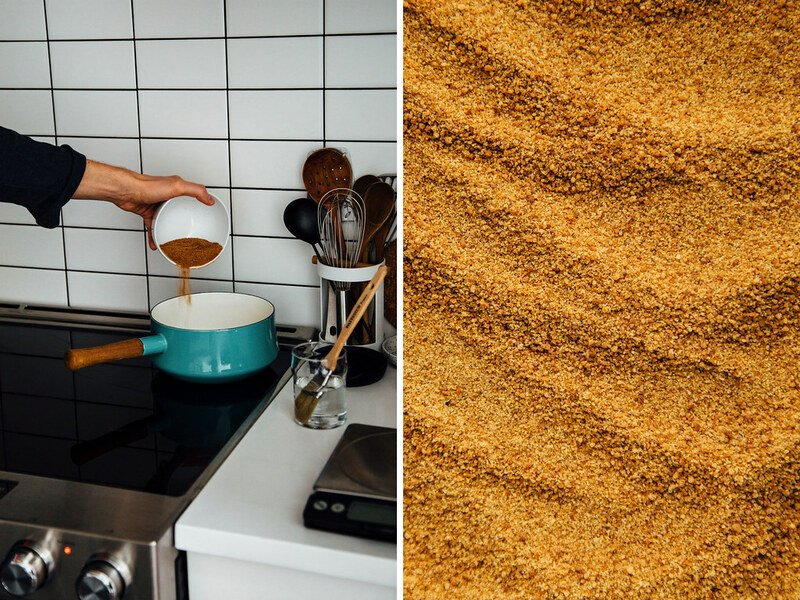 If you don't want to use coconut sugar, you can use brown sugar, muscovado sugar, sucanat, etc. 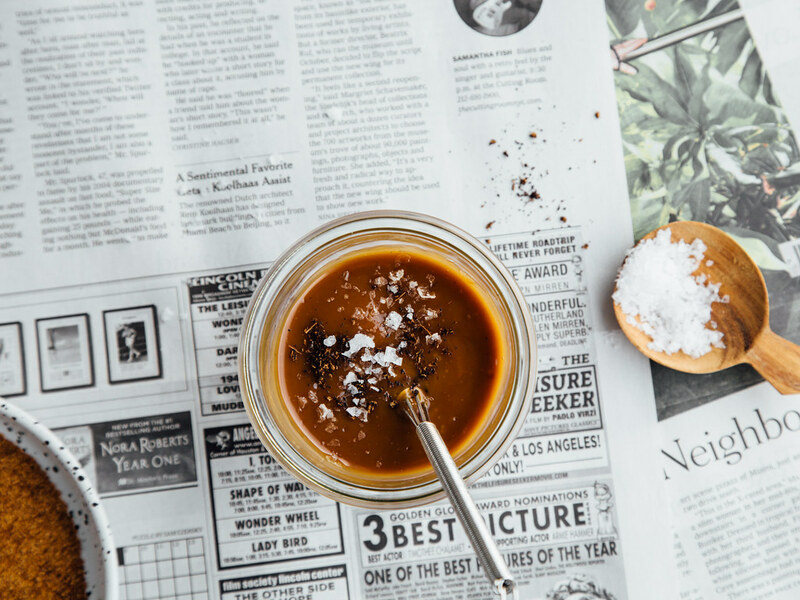 For a true caramel sauce that's elastic in consistency (read: more similar to traditional caramel sauce), increase the sugar to 3/4 cup (105g) and add five minutes on to the cooking time (oh, and make sure you use coconut milk, not cream). Shake up the can of coconut milk (or cream) then pour it into a medium saucepan set over medium-low heat. Bring to a boil then whisk in the sugar. Using a pastry brush dipped in water, wash the sides of the pan to ensure it's free from sugar crystals; if any crystals make it into the final product it will cause the caramel cream sauce to develop a gritty consistency (gritty = bad)*. Cook for 15 minutes then whisk vigorously and cook 5-10 minutes more. Once it finishes cooking, off the heat then give the caramel one last good whisk. Pour it into a glass jar and stir in the salt and vanilla bean powder, if using. Let cool (undisturbed) to room temperature then cover with a lid and chill in the refrigerator. Will keep for up to two weeks. 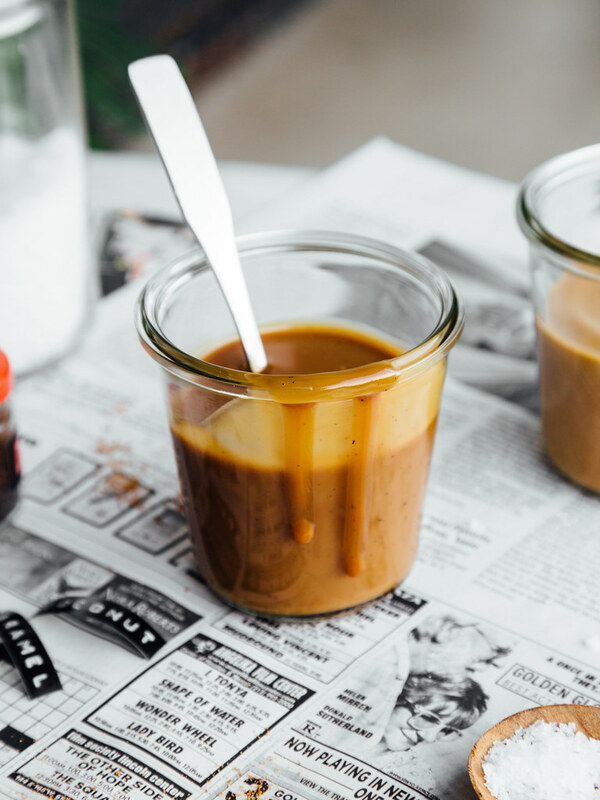 After a few days in the fridge, the caramel cream sauce will firm up considerably - simply melt the sauce in a hot water bath to return to a caramel-like consistency. 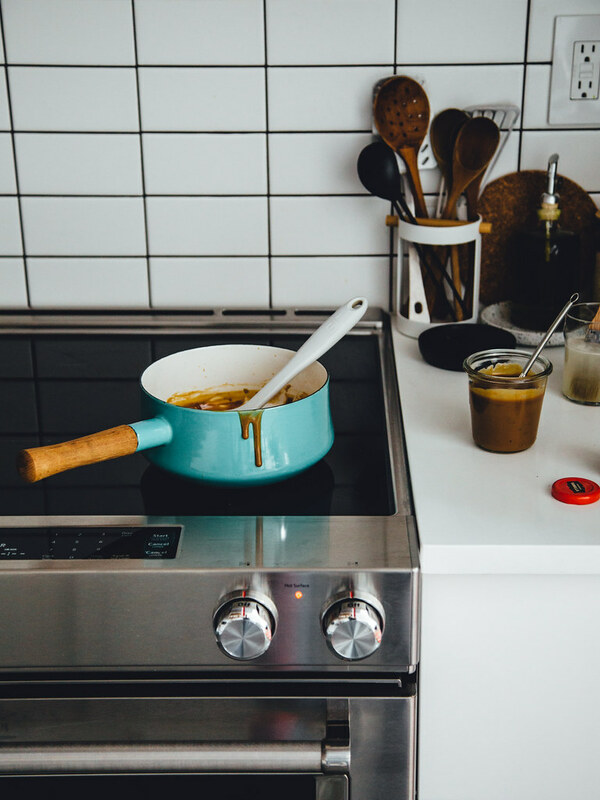 *If you wind up with gritty caramel cream sauce, pour it into a small pan and bring to a boil; boil for 2-3 minutes, making sure to wash down the sides of the pan. Truffles (use coconut cream) - Mix four ounces of melted cacao butter into the caramel cream sauce then chill in the refrigerator until firm. Shape in to truffles using the method in this truffle post. Thumbprints (use coconut milk or cream) - Angela's thumbprints + this caramel cream = what holiday cookie dreams are made of. Coconut-pecan pie bars (use coconut cream) - The original recipe is a no-bake number but I've been dreaming about a baked version using this caramel cream sauce + the crust recipe I'm going to share later this week. Sandwich cookies (use coconut cream) - I have a feeling this stuff would be delicious sandwiched between two masala chai snickerdoodles. Just sayin'. Caramel apple crumb pie (use coconut milk) - Simply swap the caramel sauce with this version instead. Apple crisp (use coconut milk) - Stir 1/2 cup of creamy pecan butter (or cashew or almond butter) into this caramel cream sauce then use it to coat the apples in your favorite apple crisp recipe. Banoffee pie (use coconut cream) - Coconut banoffee pie, to be exact. COMING SOON.